Manipal, Feb 2, 2015: “India has not been able to transform the discoveries of Indian scientists into technology. 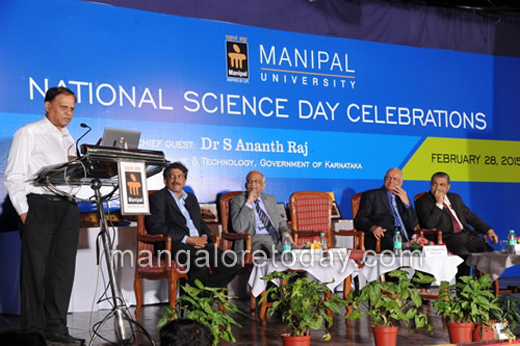 That has been done by others,” said S. Ananth Raj, executive secretary, Vision Group of Science and Technology, addressing students during the concluding function of the National Science Day celebrations of Manipal University on Saturday, Feb 28. Dr. Raj said that C.V. Raman, Jagdish Chandra Bose, Srinivasa Ramanujam and Prafulla Chandra Ray had all contributed immensely to science, but India had not developed the technology based on their contributions. With that he emphasised the importance of science. He criticised the semester system in educational institutions. “Both learning and teaching require time. It cannot be done in a hurry as in the semester system. The previous system provided for more creativity,” Dr. Raj said. H.S. 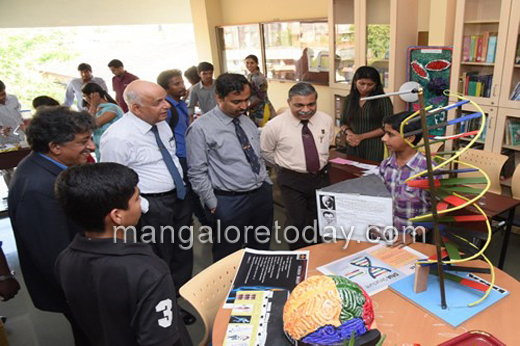 Ballal, Pro Chancellor of Manipal University, lauded the students for taking part in the science competitions. G.K. Prabhu, registrar of Manipal University, welcomed the gathering and delivered the introductory remarks. H. Vinod Bhat, Pro Vice-Chancellor and K. Satyamoorthy, Director of School of Life Sciences, were present. Deputy Commissioner R. Vishal had inaugurated the science exhibition at the School of Life Sciences.